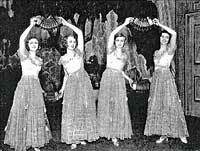 During the 1920s and ’30s, the concertina virtuosi known as the Fayre Four Sisters—Inga, Tina, Sylvia, and Lillian Webb1—were among the most popular performers on the British music hall and vaudeville circuits. They represented the end of the line for the “class” act that combined female good looks, fancy choreography and sets, and a repertory of light classical music (some of which had been popular since the early nineteenth century), along with more recent pop hits (see Fig. 1). 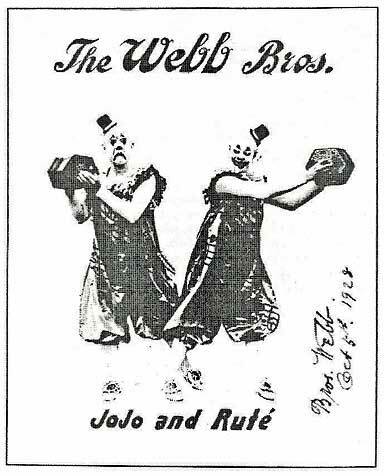 The sisters were the daughters of Joseph Webb, one-half of the popular musical-clown act of Root Toot (also called Ruté) and JoJo (Root Toot was Joseph’s brother Robert) that was active from the 1880s to the 1920s (see Fig. 2).2 As did many other musical clowns, the brothers incorporated a number of instruments with comic potential into their act. And with its floppy bellows and easily wrought squeaks and squawks, the concertina had broad appeal to circus performers. The Web brothers even had a “giant concertina” built which consisted of a large shell that surrounded a real, playable instrument. It was not long before they were imitated both in England and on the Continent. Even novelty acts on the vaudeville and music hall circuits were soon smitten by the instrument, and we thus have tales of concertinists accompanying magicians and even singing parrots. And from those clowns having done this funny invisible music, poking each other and sitting on the back of a chair and everything, suddenly the lights went down, and then all you’d see were these two clown faces And they’d play this lovely organ music, The Sicilian Hymn, and then dad went into The Bells. And of course, after that, everybody learnt to play it. But I learnt to play The Bells standing behind my father. He always went into a different world when he played The Bells. And I had to stand behind him and follow his … swinging movement so as to get the real thing … . The “really good teacher” turned out to be “Madame” Marie Rowbotham, a well-known concertinist and a member of the Chidley family, which was itself related to Charles Wheatstone and played a prominent role in the manufacture and promotion of concertinas.7 And although Rowbotham was not really a music hall performer—she played classical music exclusively and appeared mainly on the recital stage—she had, by the turn of the century, gained a following with music hall performers and was not at all our of her element teaching the daughters of a musical clown. Thanks to their close connections with the firm of Wheatstone, the Fayre Four Sisters had easy access to the entire “consort” of English concertinas: thus Tina and Sylvia played trebles, Inga the baritone, and Lillian the bass, with all the instruments coming from among Wheatstone’s top-of-the-line Æolas, octagonal-shaped instruments with black leather bellows and bloac, ebonized wooden ends. But when an early promoter decided that the black concertinas were “too funereal-looking” for a female quartet, the girls went to Wheatstone, which provide3d them with custom-made, gold-laminated instruments (including gold leather bellows). And if, according to the sisters, Wheatstone was initially reluctant to “gussy up” its instruments, the firm recognized their need for a touch of flamboyant showmanship. Indeed, in their heyday, the Fayre Four’s flashy-looking concertinas were matched both by their numerous and lavish costumes and by the elaborate sets that they used as backdrops for their act. Inga: My sister started by singing it, and we played it first, then she sang a phrase, and danced a phrase, and then the four of us just joined up together, and did a waltz. … we certainly danced with the instruments. Sylvia: You’ve got two instruments that side, and the other girl has got the opposite ends of the two instruments. Now it took us quite a while to be near enough to go over without hurting the instruments. You se, we didn’t want to ruin our instruments … . Lillian: I was terrified that they were going to tear apart. We always like working cute ideas because … they add a little excitement to [the act]. When we did The Volga Boat Song [sic], [we] slung the concertinas over our heads, it took hours to rehearse it. You were playing on one instrument with the left hand and on another with the right hand. And we made it look like the rowing of the boats … always got a round of applause. One of their most popular numbers was A Trip Around the British Isles, which featured different hats for the different national melodies of Ireland, Scotland, and Wales. Sylvia said: “We only had hats on [plus musically unrelated costumes from shoulders down! ], but it just gave the suggestion. Much better to suggest things than to do the whole thing … .” They had hunting hats for The Hunter’s Reel, while Lillian wore an Irish tam and a little green cape for the Irish selection; the medley ended with all four sisters playing imitations of the Scottish bagpipes. Although the sisters played classical music exclusively when they first began to perform, they came to realize that they had to broaden their act to interest the audience. Sylvia recalled: “First of all, we were terribly classical; we were snooty, yes. We were going to educate the people, and the people educated us!” They began to add what they called “rhythm numbers” to their act, jazz and pop songs of the day. 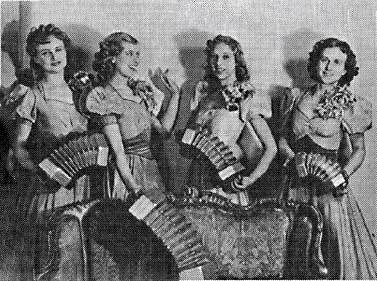 And when, in the 1930s, the accordion became popular and audiences began requesting that they play that better-known instrument, the girls quickly came up with an idea: they would open the show playing four accordions, and then replace them—one by one—with concertinas. This, according to Tina, was to show what a superior and “beautiful tone” the concertina had. Inga: Each stud played a chord. they only had four studs, and each played a chord … . And we played the melody in the front … . The great expense of amanufacturing the sixteen custom-made instruments caused the sisters to keep this act on the road for two years. 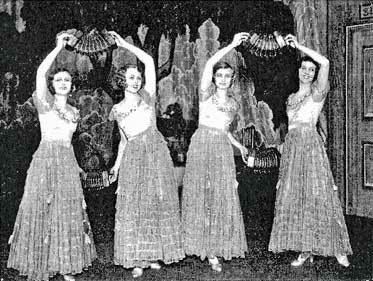 The Fayre Four made only a few recordings.10 In 1933, a Scottish fan formed the “Great Scott” label and released two 78 recordings.11 The sisters’ own Russian Fantasy, a medley of well-known Russian melodies, featured their performance of The Volga Boat Men, with Tina playing rapid upper-octave runs on the piccolo concertina.12 The medley also included the familiar theme of Tschaikovsky’s 1812 Overture, and ended with—of all things—the ever-popular Imitation of Church Bells. Another impressive piece recorded around this time was Tina’s arrangment of Raggin’ the Scale, a novelty rag hit of the era.13 Tina captured the light syncopation of the piece, and her lightning fast playing of the scale passages is a highlight of the recording. The sisters recorded one more 78 in the early 1950s, this time as a promotion for the Wheatstone company. They finally put to record their impressive version of Flight of the Bumble Bee, in which Tina displays her dazzling virtuosity. Indeed, Sylvia admitted that the other sisters had trouble keeping up with her: “[She] didn’t play it smeary, just slither over the notes; [she] really played the notes. Oh, but it was hells-bells for everybody to keep up with it … .” This led into Leroy Anderson’s 1954 hit Forgotten Dreams, which Tina treats to a lush arrangment that is reminiscent of accordion styles of the day. Moreover, it shows that the sisters were quite up-to-date in terms of their repertory. Although the music halls pretty much dried up after World War II, the sisters continued to work sporadically on radio and television. 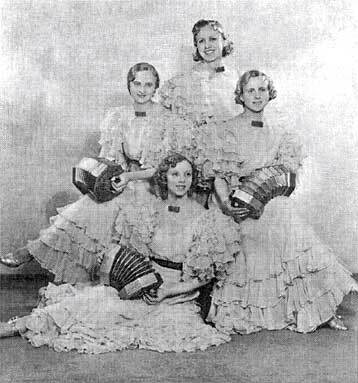 And when a group of concertinists founded the International Concertina Association in London in the early 1950s, the Webb sisters were invited to perform at its first festival, and served as judges for the competitions. And it was as participants at other such local events that the Fayre Four Sisters brought their career to a quiet close. As noted above, it was in January 1975 that I traveled to London with the express purpose of recording a number of the legendary, but aging concertinists. Thanks to a kind introduction by Frank Butler, I was able to meet the Fayre Four Sisters, who were living together in a small row house in South London. I spent a day with them, interviewing them about the heyday of their music hall careers. Still spunky, the sisters—then in their late seventies and early eighties (see note 1)—played their arrangement of The Lost Chord from memory, just as they had at the beginning of so many of their performances. And although Lillian admitted that she had trouble keeping up on the bass part, it was remarkable to hear this music spring to life much as it had decades earlier. The original version of this article appeared in The Free-Reed Journal 3 (2001) 79–77, published by The Center for the Study of Free-Reed Instruments (CSFRI) at The Graduate Center of The City University of New York. Recordings of historic players dating from 1975. Includes tracks by the Fayre Four Sisters, Wilfred Pearce and Reuben Shaw, Alf Edwards, Harry Crabb, Gregory Matusewitch, Henry Minting, and Richard Carlin. Available for purchase from the Smithsonian Institution website at www.folkways.si.edu. Samples of each of the tracks can be listened to free on the website. Notes on and reproduction of music for one of the perennial staples of concertina performance. As published in The Free-Reed Journal, 3 (2001) 108-112. A full transcription of a manuscript now in the British Library, catalogued there as: Additional Manuscript 71124 Q, Recollections of the manufacture of the English concertina from 1844, by George Jones; . Presented by F. E. Butler, Esq., grandson of George Jones, 29 Aug. 1988, and incorporated in 1993. ff. 331 x 207mm. As published in Concertina Magazine, 13 (Winter 1985): 4–5, and 14 (Spring 1985): 4–7. Previously published (with heavy editorial additions) in FreeReed: The Concertina Magazine, No. 16 (November 1973): 14–20. A link is provided to PDF scanned versions of both publications.